There are a lot of reasons people in Austin switch their dry cleaner. They are new to Austin and need to find a local cleaner to keep them looking sharp. Or they move within Austin and are looking for a dry cleaner convenient to their new neighborhood. Or they are looking for something different than what their current drycleaner provides: a greener & safer dry cleaning method, pick-up & delivery service, Sunday hours, an app to make things easy or excellent customer service and attention to detail. Whatever your reason for switching cleaners, your search is over. EcoClean is the Best Cleaner in Austin. From day one, our goal has been nothing short of revolutionizing the garment care industry. We are re-inventing everything from how your clothes are cleaned to how to make your experience convenient and enjoyable. If this description fits you, I'm sure you're wondering, "How can I find the best dry cleaners near me?" Well, look no further! Our premier dry-cleaning service is designed to exceed our customers’ expectations at every turn because we strive the be the best cleaners in Austin, TX. Our customer service staff and drivers are ready to answer any questions and be of assistance throughout the process. When you call us, the first person you speak with is our Customer Liaison. They will assist you directly or route your call to the best person to help. Wet Cleaning is not only the greenest way to professionally clean your garments, it is also the best way to actually get them clean. We can easily remove spots that stump other cleaners and garments are pressed to perfection every time. Another significant advantage of wet cleaning is that clothes are cleaned in biodegradable soaps and conditioners instead of perchloroethylene (perc) leaving them smelling fresh instead of having that “dry cleaning smell”. Fabrics last longer, look better, and won’t irritate your skin with solvent residue. An important part of having an outstanding service experience is to make communicating easy. When you call or email us with a question or concern, we will get back to you that business day. When we have questions or concerns about your garments or preferences, we contact you via phone, email, or text before cleaning to make sure we get it right. When we pick-up or drop-off your clothes, we will send you a short text to let you know. When you have forgotten you left something with us to be cleaned, we will send you an email reminder. If you're still wondering, "Are there any good dry cleaners near me? ", you're in luck! You've got access the best cleaners in Austin, TX! The consumer experience is rapidly becoming more and more effortless. We can use our phones to schedule a ride, pre-order a coffee or to check-in for a flight. We can shop extended hours or have something delivered next day. We do all this to be the best cleaner we can be! At EcoClean we are working hard to make our service experience as effortless and convenient as possible. We have rolled out a suite of technology solutions to save you time and make getting your clothes cleaned hassle-free. With our new app you can sign up for service, schedule a pick-up, check your account status and update your credit card all at the touch of a button. You can also let us know when you are on your way to pick-up your items, and we will have your order ready when you arrive. We send text notifications to our delivery customers to inform them when items are picked-up and when they are dropped off. We have four Austin locations. South Lamar near Oltorf, North Lamar near 45th Street, West Anderson Lane near Burnet Road & West Lake Drive and 360. Each location has easy access from major Austin thoroughfares and ample parking. You will find a friendly customer service representative waiting to serve you in clean, modern, and bright space. We have extended our service times to accommodate a wide range of work schedules and Austin traffic. We are open from 7am-7pm weekdays, 10 am – 5 pm Saturdays, and are the only cleaner in Austin that is open on Sundays from noon-5pm. We also offer a no-charge rush service. Just let us know you need your items back sooner than the normal turnaround time (2 business days) and we will make that happen. Our free pick-up and delivery service is the backbone of our mission to take the pain out of the dry cleaning chore. Combined with our mobile app, this service allows you to get your cleaning done without ever going to the cleaners! The delivery service is very popular with condo and apartment residents living in high-density areas with limited parking. EcoClean works with concierges and resident service coordinators to provide secure, valet-style dry cleaning service to Austin Condos and apartment complexes. We're certainly making dry cleaning easier with our many efforts to continue to be the best cleaner in Austin! At EcoClean we use a method of garment cleaning known as “wet cleaning”. Wet cleaning is an eco-friendly dry cleaning process that can clean virtually any garment that can be dry cleaned. We use biodegradable detergents, fiber conditioners, fresh water, and computerized washers and dryers to clean your clothes. Each machine is programmed to create the ideal cleaning or drying environment based on fiber type, finish, weight, construction and soil. Wet Cleaning system was developed over 20 years ago in Germany as part of their commitment to ending the use of toxic chemicals in the dry cleaning industry. Clothes that have been wet cleaned smell fresh and have a softer look and feel than clothes that have been dry cleaned. Wet cleaning is also often able to remove stains a traditional dry cleaner can’t. Hands down, wet cleaning is the best and safest way to get your garments clean. EcoClean offers free pick-up and delivery throughout the Austin area. You pay the same price as a delivery customer as you would in any of our 4 Austin area locations. With our new app, scheduling a pick-up is easy. Just open the app, pick a day and hit the schedule button. Your cleaned & pressed clothes are delivered back to you within 2 business days. We serve the entire Austin Area providing no-fuss premium dry cleaning to homes and offices in 35 zip codes. 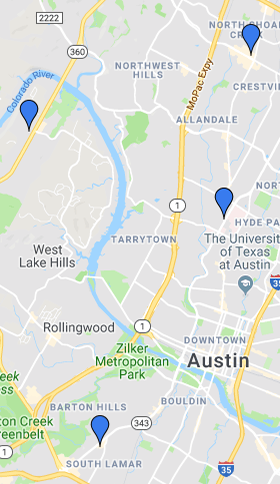 All of Central Austin, Westlake, Bee Cave, Circle C, Sunset Valley, Mueller, Wells Branch, Jollyville, and Anderson Mill are all included in our delivery area. When you schedule a pick-up, you will receive a text from your route driver when your items have been picked-up. You will also receive a text when your items are delivered back to you. We keep you informed so that you don’t have to wonder or worry about your clothes. We can flex to accommodate your busy schedule by combining store visits with the delivery service. You could drop something at any of our stores and request that it be delivered to your home or office or have your items picked-up at home and returned to one of our stores. Whatever combinations are most convenient for you. EcoClean has partnered with Austin-Bergstrom International Airport (ABIA) to be a new pick-up and drop-off location for EcoClean to make getting your dry cleaning done even easier. When you use the Family Friendly or Executive Valet Parking service, you will be able to leave your garments in the EcoClean drop box located at the Valet station. When you return from your trip, your clean pressed clothes will be in your car waiting for you. Yes, it is that simple. It is easy for us to just say we are the best dry cleaner in Austin. But it is also what lots of other people are saying! EcoClean has won the “Best Dry Cleaner” award in 5 of the last 7 years. The Austin Chronicle annually recognizes the best local businesses, including dry cleaners. EcoClean has won the award in 2018, 2016, 2015, 2013, 2012, 2009 and 2006. EcoClean is also rated highly on Yelp! and Google+. Across 270 reviews we have an average rating of 4.3. At EcoClean we clean lots of things that people would normally expect of a dry cleaner. We clean Shirts, Pants, Suits, Dresses, Blouses, Skirts, Evening Gowns, Sweaters & Ties. We can also clean Costumes, Children’s Clothing, Hand-wash Delicates, and Non-leather Shoes, Purses and Luggage. Within outerwear we clean Coats, Jackets, Hats, Scarves and Gloves. Wedding dresses are a specialty at EcoClean. Wet Cleaning is the most effective way to clean and preserve your wedding gown. Muddy hems, wine and coffee stains, and even layers of tulle littered with leaves and grass are no obstacle for us. We return even the most abused gowns to their pre-wedding glory. Over time, gowns that are cleaned in PERC yellow and become dull. A wet cleaned and preserved wedding dress will maintain its original color and brilliance for decades. EcoClean also offers a wash & fold laundry service. If you are tired of doing laundry at home, just put everything in a bag and let us to do the hard work. We will wash and neatly fold every item and charge you by the pound. We also clean a wide range of items which many people are not aware can be professionally cleaned. Within household items, we clean Down Comforters, Poly-Filled Comforters, Duvet Covers, Bedding, Blankets, Quilts and Throws. Many home items can also be cleaned including Futon Covers, Couch Cushions Covers, Chair Cushions Covers, Pillows, Rugs, Dust Ruffles and Pet Beds. EcoClean serves many local businesses large and small. We clean Aprons, Chef’s Coats, Lab Coats, Clean Room Garments, Uniforms, Smocks, Try-on socks, Banners, Tablecloths, Raw Fabric, Sheets, Towels, and more! The is a very good reason why we have been voted best dry cleaners by the Austin Chronicle. We strive to be more than fine dry cleaners. We want to maintain our reputation as the best dry cleaners in Austin, TX! We understand our customers’ needs and concerns and take them seriously. Whether your having your wedding gown preserved or your favorite old flannel cleaned, we get it… it matters! When you trust us with your garments, we treat them as if they are our own. No detail is ignored. We test garments to check for bleeding, repair broken seams, trim threads, shave off pilling areas, replace broken buttons, and alert you when your garments need repair before cleaning. We track every garment from the first inspection to final delivery to ensure that you get your order back clean, pressed, complete, and ready to wear! Our cleaning and pressing teams have over 80 years of combined garment care experience and take enormous pride in their work. As members of the Dry Cleaning and Laundry Institute we stay informed about fabric and garment trends and new technologies, and have access to a garment analysis lab should we ever need help. Our customer service team and managers are committed to making sure your questions are answered and your expectations are exceeded. We love what we do and are always happy to discuss your needs and find solutions for your cleaning challenges. EcoClean is able to clean virtually everything other dry cleaners in Austin can clean. Sorry you’ll have to take your leather pants and mink coats somewhere else. Our wet cleaning process is the most environmentally friendly dry cleaning process available and the process used by the best dry cleaners in the world. We use water, special bio-degradable soaps, computer controlled washers, dryers and pressing equipment to leave your garments soft to the touch and healthy for you. There is always a concern when you are trying something new, that there will be problems. We work very hard to give our customers the best possible experience. Don’t take our word for it. Read what our customers have to say. Oh, and we also have won best dry cleaners Austin five times: 2016, 2015, 2013, 2012, 2009, & 2006!